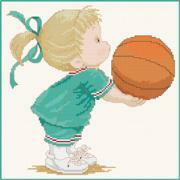 This design portrays a young girl in a backetball uniform. Download Only: $2.99 You will download the pattern. Nothing will be mailed, so you pay no printing or shipping charges.